For one giddy three-hour stretch on Friday night, the NCAA Tournament reached the level of madness fans dream of happening every year. At around 7 p.m., No. 15 seed Norfolk State shocked No. 2 seed Missouri in a thriller. Right after that, No. 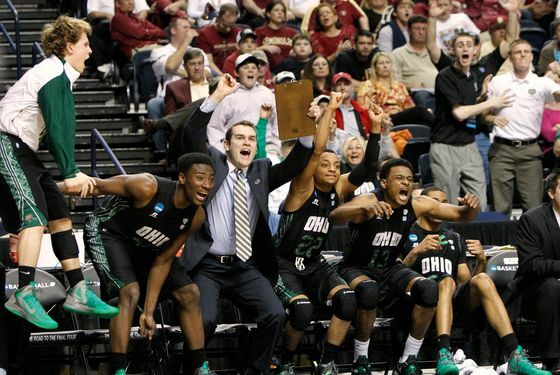 13 seed Ohio outlasted No. 4 seed Michigan and, in the most beautiful cut of all, No. 15 Lehigh beat (handily, all told) No. 2 seed Duke, the sort of upset that becomes the lasting image of the tournament. We'd had only one 15-over-2 upset in the last decade; Friday gave us two in two hours. After that, the tournament went back to normal. For all the chaos of Friday, your bracket is probably a lot better off the closer you hewed to chalk. Of the Sweet 16 teams, only one of them is a mid-major (Ohio, though two if you count Xavier, which you probably shouldn't), and the traditional powers spent Saturday and Sunday asserting their authority. Lehigh and Norfolk State were destroyed, No. 1 seeds cruised, and everything settled back into the way college basketball tends to settle come the Sweet 16. Your favorites are still the top seeds. The only difference is now they have two fewer No. 2 seeds standing in their way. North Carolina is in some trouble thanks to the wrist injury to Kendall Marshall, and Syracuse is still dealing with the loss of Fab Melo. It still sort of looks like No. 1 overall seed Kentucky's tournament. The upsets are all grand and fun, but they never last as long as you want them to. There will be no Butler or VCU this year. As for our New York Magazine bracket, in first place right now is "mmccarre 1," who nailed 12 of the final 16. He/she's in trouble after that, though; he/she has already lost three of his/her final eight, and one (Missouri) of his/her Final Four. So it's anybody's ballgame, as they say. They say that.